Ms. Anna Jones, Producer/daughter/narrator sets out to explore her father’s improbable rise from sharecropper to education leader. To her surprise, she discovers that he led a long and arduous movement for equal education in Northampton County during the Jim Crow Era, brought a fractured community together, and helped transform the educational landscape for all of the County’s children. Mrs. Edna Davis-Brown, Student, Gumberry High Class of 1977 and Sunday School student at Roanoke Chapel Baptist Church. Mr. Melvin Broadnax (d. 2012), Former, politician, educator, civil rights leader, and Mayor of Seaboard, N.C.
Attorney Rufus Edmisten, Former NC Attorney General and Secretary of State. Mr. Grover Edwards, Member, Northampton County Board of Education in the 1970s. Dr. Dudley Flood, School Desegregation and Race Relations Specialist in the North Carolina Department of Public Instruction, 1960s and 1970s. Dr. William Friday, (d. 2012), Former President of the University of North Carolina System (1956 to 1986) and a revered leader in the state. Dr. Willie Gilchrist, Teacher and administrator in the Northampton County Schools, 1970s to 1990s, and a deacon at Roanoke Chapel Baptist Church. Mr. Marshall Grant, Retired farmer, politician, and community leader whose political philosophy was opposite that of James Jones in the 1960s and 1970s. Mrs. Lucille Hardy, Friend, relative, and peer who grew up with Jones. She is the oldest living member of his church and pianist for over 70 years. Mr. Wayne Jones, Son. In 1965, he was one of the first Black students to integrate all-white Gaston High School, a hotbed of resistance. His story reveals the emotional impact he felt as the son of the leader for integration in Northampton County. Mr. William “Bill” Long, Retired farmer and descendent of owners of Longview Farm, formerly Longview Plantation, where Jones ancestors were enslaved and where their free descendants sharecropped. Judge Perry Martin, Former attorney, politician, judge, and power broker who worked on both sides of the school integration issue during the 1960s and 1970s. Dr. Willis McLeod, Northampton County’s first black school superintendent, hired in 1982. Mr. Henry Moncure, Businessman and Politician. Mrs. Edna Wilkins Moody, Student, Northampton County High, Class of 1969. Mrs. Kube Sherron-Jones Neill, Daughter, designated to attend all-white Gaston High School in 1969. 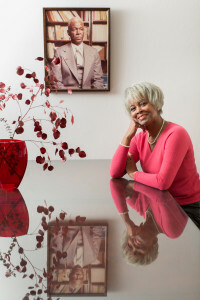 She became an outspoken lightening rod for controversy during the school integration era. Dr. John Parker, Student, teacher, and administrator in Northampton County in the 1970s and 80s. He served as the interim superintendent in Northampton County in 2014. Mrs. Shelby Hardy Phillips, Member, Roanoke Chapel Baptist Church. Mrs. Patsey Moseley Tann, Student, Gumberry High, Class of 1977. Rev. Charles Tyner, Student, teacher, administrator, and community activist in Northampton County, 1970s to 1990s.